When you’re lucky enough to live and work with the sea and beach at the end of the road, when you run along Beachy Head and the Seven Sisters as a matter of course and when you help manage some of the finest holiday homes around Eastbourne, it’s easy to become rather blase about our neck of the woods. But you should have heard my in-take of breath as I approached Friston Down! As I parked in the courtyard, racehorses were galloping along the downs below us, lambs were gamboling in the field over the fence and birds celebrating the genuine arrival of spring. The Cottage at Friston Down is an annexe to the main country house, set within expansive gardens, with 3-bedrooms, a private entrance and access to a swimming pool. And have I mentioned the setting?! Friston itself is a delightful village that sits on the South Downs, just 4 miles West of Eastbourne, with majestic views towards the Seven Sisters and the English Channel and provides a gateway to the South Downs National Park. 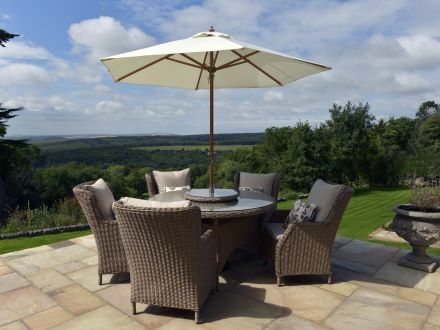 Enjoy a sunny lunch on the private terrace, a dip in the pool or cycle and walk along the South Downs Way which literally runs along the front of the grounds. Stroll down into East Dean for a hearty meal at the Tiger Inn or award-winning Thai Terre restaurant on the the green, soak in the history of the Saxon and Norman influenced church or hop onto a frequent bus into Brighton for the buzz of their creative scene. If that sounds interesting I suggest you email info@exclusivelyeastbourne.co.uk or phone Carl & Sarah on +44 (0)1323 722774 for more details or to book this fabulous holiday home near Eastbourne and Brighton. Since it’s only just come within our holiday accommodation all keys dates are currently still available and prices start from just £950 in the summer. Maybe after a week or so you might just get nonchalant about those views too. But I doubt it!